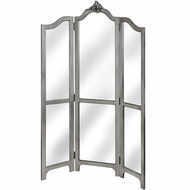 One of the easiest ways to add vintage elegance to a room is by adding a room divider screen. Available in a wide range of styles, these room screens close off elements of your space for getting ready. Not only do these room divider screens look stylish, they’re also a practical addition to any boudoir. At Baytree Interiors, our selection of room screens includes both vintage room dividers and our ever popular mirror room dividers. Depending on the style of your home, the divider screen will help create dedicated space in your home. Portable and effortlessly attractive, you can transform even the simplest space into a Parisian dream. Find the perfect room divider screen at Baytree Interiors today, or take a look at our collection of vintage photo frames and ornate style chandeliers for more chic decor inspiration.